Who’s afraid of a little high ISO? I came to photography through landscapes and, as I became more enchanted with wildlife, I battled away at my wildlife photography with my landscape photographer’s attitude to ISO .. keep it as low as possible and get those lovely rich colours and great detail. Great in theory, it meant I often ended up: wishing that I could afford better, faster lenses; or wishing that I lived somewhere where there’s great light all-day, all year-round; or with blurry or soft shots because of insufficient shutter speed or not enough depth of field. Sure, sometimes it all came together and I got the shot – but, more often than not, I would get a half-decent but dark shot that when brought up in Lightroom resulted in graininess and lack of detail. Not a great success rate really and, with no guarantee of consistency, not a very professional way of going about things. But things have gotten better – and here’s how. With that old chestnut ‘the definition of madness is doing the same thing over again in the hope of a different result’ ringing in my head, I decided to take a step back and re-evaluate my whole approach. The problem was that moving animals and birds in particular require fast shutter speeds and the ‘sweet-spots’ of my Tamron 150-600 and my other long combination of Nikon 70-200 with 2x tele-converter were both at least f8. Put those two issues together and we’re looking at very high ISOs. Coming from landscapes, where, with a tripod, I could more or less just set as low an ISO as I wanted, I had tried the same approach for my wildlife shots – not as low as for landscapes but low in relative terms with ISO 800 and I was setting that ISO as fixed. So when (not if) I didn’t get the shot I was looking for, when it came out blurred or soft, I would cautiously and dejectedly up the ISO to maybe 1000 or possibly even 1250 thinking “there goes any chance of a nice quality shot!”. And, of course, I would be proved right .. but for the wrong reasons. What would happen was that by turning up by the ISO a couple of clicks, I would start to get shots without blurring but which were still quite dark. ‘But at least they are sharp’ I’d tell myself and I’d head home to try to bring up the exposure in Lightroom. Of course, when I did this, there was no detail to bring up in the shot – all that happened was that the image got noisier, I got frustrated, cursed the poor quality of my camera’s ISO, and wished all the things that I wished at the start of this post. So what was the solution? Well I started taking a look at other people’s shots and EXIF information and wondering what was going on. I was seeing shots at 3200 ISO and higher that looked pretty good to me. Was it my camera? Was it my knowledge of noise reduction editing? There was something I was missing. And then it struck me as I was re-reading about ETTR (exposing to the right), something which I’ve used in landscape work and which relies on the fact that digital sensors capture much more detail in the right hand side, the bright side, of the histogram than in the shadow or left side. My shots were very dark with histograms heavily over to the left. So, of course, when I had pulled up the exposure in Lightroom, there was no extra detail to bring up in the shot .. I just hadn’t recorded it. So maybe the solution was to push the ISO right up and see what happens. On a cloudy and windy winter’s evening, at 30 minutes before sunset (worthy test conditions), at ISO 3200, I took a shot of a seagull in the air. Checking the in-camera histogram: showing bright .. nicely pushed up towards the right hand side. I get the shot home into Lightroom. The bird is sharp, the colours are all there and this time, we’re exposed to the right and I am pulling the blacks exposure slider down. Yes the initial image is grainy but as I make my adjustments I’m adding no new noise into the photo. A bit of noise reduction now and I can even apply a little sharpening and there’s a shot – one that I’m quite happy with. 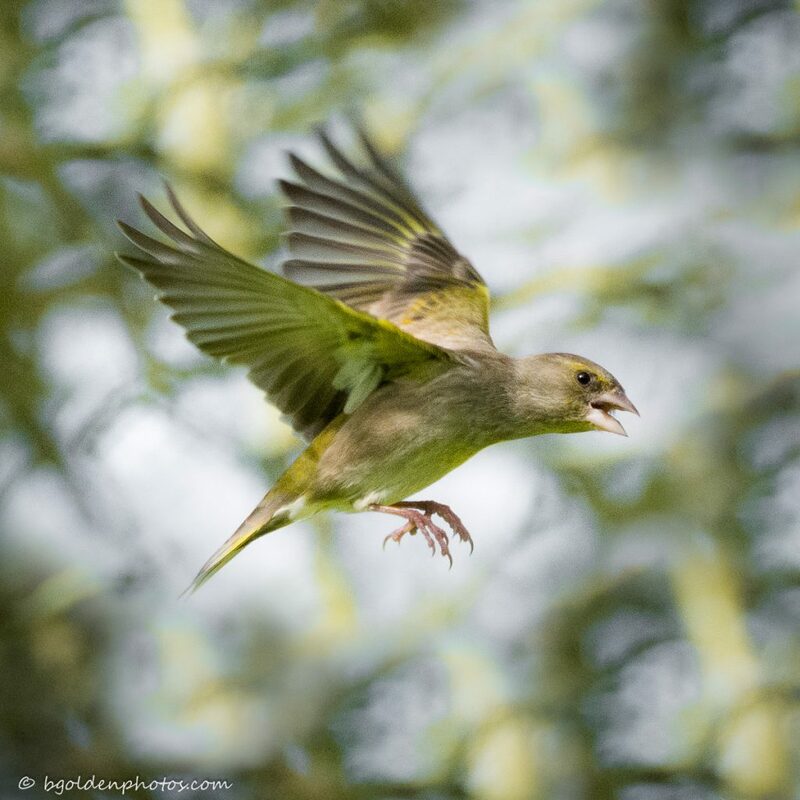 I was soon experimenting with with shutter speeds of 2000 and apertures of f8 on Greenfinches at my winter birdfeeder and at 3200 even 4000+ ISO I as getting shots like the one above. So there it was – after all this time fearing ISO, I had embraced it and the results were a happy surprise to me. Of course, once I came to this realisation, it didn’t take long for me to recall that camera feature that I had discarded as pointless way back as a landscape photographer: Auto-ISO. On the odd occasion that I had slipped the camera into this mode, I had been bewildered as to why you’d want to let your camera set your ISO to 4000. Now I could see its benefits: what if you set the camera to Manual, set your speed to the minimum speed you require to get your subject sharp, set your aperture to whatever you want on an artistic level and then let your camera decide where your ISO should be – you’ll end up with a sharp subject in a nice depth of field and well-exposed photo. Yes, it might be grainy but you can happily accept that as a style or work with all that lovely recorded detail in Lightroom. And perhaps, if the sun should break through the cloud for a split moment, you might end up with all of those things and without any grain at all as the camera reacts to the conditions and pulls the ISO down accordingly. So that’s how I came to love auto-ISO .. I hope you didn’t take as long as I did in coming to this realisation! Next time I think I’ll continue this train of development and fill you in on the rest of my camera settings for wildlife photography and in particular on assigning exposure lock and auto-focusing to custom buttons. Until then happy snappers.